Speed and convenience are just the start of the advantages an electric kettle offers. These countertop appliances also reduce the risk of fire by shutting off automatically when the water boils, or before the kettle boils dry. Some can also be programmed to hit the specific temperatures at which each type of tea brews best, then hold that temperature for a while in case you want a second cup. Finally, because an electric kettle's base stays cool, even when the water inside is boiling, you can take it with you to the table without concerns about marring the surface. Of the kettles we evaluated, the Cuisinart PerfecTemp CPK-17 (Est. $100) takes top honors for offering just the right blend of value and features: You get six preset temperature settings for different tea types (and, for coffee lovers, a French press setting), a pleasant beep to indicate your water is ready, and an automatic 30-minute hold temperature feature. Both the temperature settings and the hold temp feature prove to be very accurate in hands-on testing from Wirecutter, although the boil-temp accuracy did fade a little at lower temperatures. 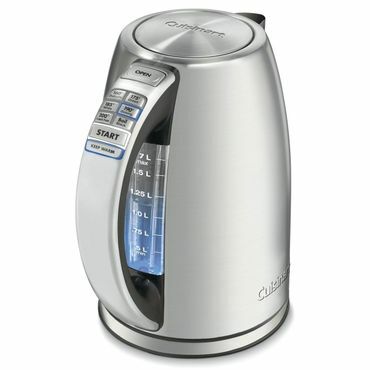 Still, the 1.7 liter (7 cup) Cuisinart CPK-17 was fast, accurate and reliable enough to take home the top honor in that test. Those same features make it a favorite with users, who also appreciate the push-button in the handle that opens the lid. Most users also get the same clean, easy pour reported by testers with Wirecutter. They like that the CPK-17's lid opening is large enough to easily reach inside for cleaning, and they say a small, backlit viewing window makes it easy to check water level inside the kettle. The Cuisinart CPK-17's few plastic components are all BPA-free, and it comes with a three-year warranty -- markedly better than most of its competition, although users aren't thrilled about having to pay shipping both ways for repairs. Finally, although we did find some complaints about rust and leaks, there are far fewer with the Cuisinart CPK-17 than similar kettles. We also noted several complaints that the lettering wears off the buttons after a few years. Although that's a legitimate issue, much of the competition wouldn't last long enough for that to be a problem. The Breville BKE820XL Variable-Temperature Kettle (Est. $130) is another standout performer in this category. It ranks third in a speed-boil test from Consumer Reports, also drawing praise for its five clearly marked temperature settings (including a French press option for coffee lovers) and a 20-minute "hold temperature" feature. That said, if anything is going to go wrong with this kettle, it's that much-loved variable temperature feature. The most common frustration users express is that the kettle keeps on boiling past the set temperature, defeating the point of a variable temperature setting in the first place and raising concerns about whether its auto-shutoff feature will work consistently. Praise for the Breville hot pot far outweighs those concerns, however. Experts and users particularly like its handsome stainless steel construction, simple and easy to read controls, and one-handed operation that lets you both open the lid and hold/pour with the same hand. A clear window with easy-to-read measurement markings on both sides and a base that swivels 360 degrees make this a great choice for lefties, and the lid opening is big enough to make it easy to clean the inside of the kettle. All plastic that contacts the water is BPA-free, but we also found some fairly recent complaints about durability problems with the plastic lid -- something we'll be keeping an eye on for our next report. If finding a solid, no-frills electric kettle at a good price is your highest priority, we like the Hamilton Beach 40880 (Est. $30). This 1.7 liter (7 cup) stainless steel kettle doesn't have a single fancy feature like preset temperature controls or a keep-warm setting. In fact, it doesn't even beep or whistle to let you know it's done, although there is an indicator light and you might hear the faint click of the "on" handle returning to position. But quite a few users like having a quiet kettle -- they say it's nicer than being beset by beeps, as happens with some inexpensive electric tea kettles -- and the Hamilton Beach 40880 automatically switches off once it's done, so there's no fire hazard. The hands-on testers at Wirecutter also like the Hamilton Beach 40880, choosing it as a runner-up. "This kettle has all of the features we look for in a basic model at a bargain price," they write. User reports on this kettle's durability are mixed but surprisingly good, given its price range; on average, you should be able to get at least a few years' use out of it. And of course, you'll prolong the kettle's life if you carefully follow the manufacturer's instructions to wipe it clean -- no immersing the kettle or getting its base wet -- and empty water between uses to avoid scale buildup. Another noteworthy competitor in this price range is the T-Fal BF6138 Balanced Living tea kettle (Est. $40). It pairs an unusually powerful 1,750-watt heating element with a modest 1 liter (4 cup) capacity. That combination, plus a metallic bottom plate for quick heat transfer inside the otherwise plastic interior, translate to a sub-four-minute boil time, the fastest in a hands-on test of inexpensive tea kettles from Your Best Digs, where the T-Fal ultimately took the runner-up spot. The T-Fal BF6138 offers a choice of three different brewing temperatures. That's an unusual feature in this price range, although some users warn that it's not terribly accurate -- so picky tea lovers will probably prefer a pricier, but more reliable, adjustable temperature kettle. Testers at Your Best Digs like that the outside of this kettle remains fairly cool, and say it's easy to pour and handle. It also has an auto shutoff once the water boils, but some users say that you might want to stick around anyway and lift it off the base as soon as the water boils. Otherwise, some water might bubble out before it shuts off. This kettle also produces a lot of condensation, which users say can make the water level viewing window hard to read, or pool around the base of the kettle and make you think it's dripping -- which is also a potential hazard to its durability. Nobody comments much on its almost completely plastic interior, except to warn that if you don't follow the manufacturer's directions to discard the water from the first few boilings, you'll find a plasticky taste. And finally, like every other electric kettle in this test, the T-Fal BF6138 is not submersible. Finally, if price or light weight is your ultimate priority and you don't mind plastic construction, you might like the 1 liter (4 cup) Proctor Silex K2070YA electric kettle (Est. $16). We do find some complaints about a mild plasticky taste or smell, although it usually goes away within a few uses of the kettle. You can speed this process by following the manufacturer's directions to boil water and discard it several times. Meanwhile, this affordable kettle is wildly popular with users who remain thrilled with how light it is -- and they say that with few features to break, there's just not much that can go wrong with it. The Proctor Silex K2070YA does have a lighted on/off switch, an auto shutoff that kicks in once the water boils, and dual viewing windows so you can check the water levels inside. It doesn't have a base, but instead plugs straight into the wall with a very short cord -- but once the water is heated, you can detach the cord and take the carafe anywhere you want to go. This Proctor Silex kettle's exposed heating element is just 1,000 watts, or about two-thirds the power of most of its competitors, but users say it still boils water quickly. The relatively small capacity helps with that. Allows you to fine-tune the temperature settings. Signals when the water is hot.